DALLAS — A bus driver with “acute sleep deficit” failed to stay in his lane and caused his vehicle to careen out of control, resulting in a wreck that killed nine people and injured nearly 40 others in 2016, federal safety investigators said in a report released Tuesday. The National Transportation Safety Board determined the bus left the road and rolled when the 29-year-old driver overcorrected and abruptly braked. The highway north of Laredo was wet from a recent rain and the bus had an inoperable antilock braking system, according to the NTSB report. The bus began its trip in Brownsville, in far South Texas, and was en route to the Kickapoo Lucky Eagle Casino in Eagle Pass. 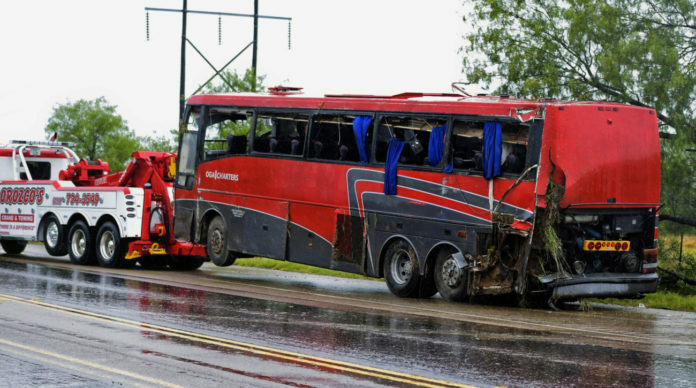 Seven passengers died at the scene, another died while being transported to a hospital and the ninth died of injuries days after the May 2016 accident. The driver, whose name has not been released by authorities, was treated for minor injuries. The Webb County district attorney’s office did not respond to a message seeking information on charges the driver may have faced. Regulators found that the driver had had little sleep in the preceding hours and had blurred vision “due to hyperglycemia resulting from poorly controlled diabetes.” The NTSB also said the windows on the left side of the bus too easily gave way, allowing passengers to be thrown from the vehicle. First-responders found some people trapped under its left side. The stretch of highway where the crash occurred, meanwhile, had not been treated with a common pavement texture that reduces skidding. The practice involves adding small pieces of aggregate, known as “chips.” Four days after the wreck, the Texas Department of Transportation added a chip sealant to the highway. “The project encompassed the entire length of the horizontal curve at the motorcoach crash location, and it was conducted to address safety concerns related to low pavement friction,” the report said. A spokesman for TxDOT’s Laredo district declined to comment, saying more time is needed to review the NTSB’s findings. Fifty crashes occurred on the same stretch of highway in the previous five years, resulting in three deaths, according to the report. The carrier, OGA Charters of San Juan, Texas, operated using two buses that were subjected to seven roadside inspections from 2012 to 2015, six of which were conducted on the bus involved in the accident. Three inspections resulted in a bus being taken out of service for brake defects and two others found driver logbook violations. NTSB investigators spoke with a company official who did not know that the bus driver had been scheduled to drive more than his allowable hours. “The NTSB concludes that, throughout its operational history, the motor carrier OGA Charters failed to provide adequate oversight of its drivers,” the report said. The company is no longer in business and faced several lawsuits stemming from the wreck. Attempts to reach someone associated with the former company were unsuccessful Tuesday.